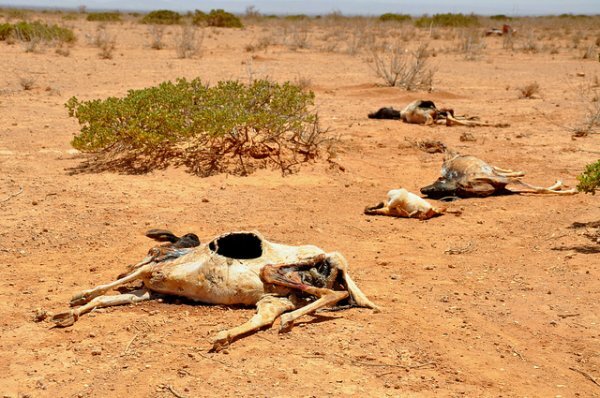 The ongoing drought in Somaliland puts millions of people in danger of starvation in virtually all parts of the country. The country is on the brink of famine, and up until now, over a dozen people have already died. Meanwhile, Somaliland’s government has intensified its relief supply efforts by distributing basic necessities and setting up food distribution centres. The Minister of Interior Hon. Ali Mohammed Waran’adde has led one of two major relief convoys that are to distribute necessary basic needs like food, water and pasture to people and their livestock affected seriously by the famine and severe drought sweeping the country. While announcing a seemingly revitalized intensive effort to distribute relief supplies, the Interior Minister said that two major such convoys were being dispatched. He said that the VP will be leading one convoy while he himself would be leading the other. The new efforts, he revealed, would consist of centres where readily cooked foods would be fed to the needy. “Initially the drought was more intense in the west (and northern) parts of the country, but now the situation has worsened country-wide”, he said. “We should pray for Devine intervention and at the same time appeal for more support from our fellow brothers”, the minister told a horde of journalists shortly before he left to the northern parts of the country. “This time we are going to set up feeding centres to help feed the needy”, he said. He said that the massive efforts will help distribute food, water and basic necessities to the afflicted areas. Led by the President who formed a national task force committee to coordinate the efforts, the government has for the best part of the past 8 weeks been working overtime to help distribute relief supplies, monitor the effects of the famine and at the same time coordinate the efforts going on. So far over a dozen people have been reported dead due to hunger and thirst, going by the latest media reports. The Awdal regional governor had initially confirmed the first eight victims claimed by the famine.